In January 2016, Arts Catalyst launched the first permanent fully public space in the organisation’s 21-year history (1): Arts Catalyst Centre for Art, Science & Technology. The ambition for the centre was to add to and extend, rather than replace, Arts Catalyst’s position as an international commissioning agency that produced work in varied local contexts as well as in partnership with museums and festivals across the globe. By providing a permanent London base, the Centre could act as a site of encounter with this national and international activity, as well as being a generative space that would host research residencies and discursive programmes that might seed new large-scale ‘off-site’ projects. In addition to this reflective / generative position in relation to projects centred elsewhere, having a (semi)permanent base allowed, necessitated even, that we develop a long term relationship with the specific community living and working in our new neighbourhood. The Centre is situated on Cromer Street in London, an area of predominantly council-owned social housing with an established community, many residents having lived on the street for several generations. This local community is made up of a mixed migrant population, hailing from a diverse range of backgrounds. As such, English is only the third language spoken in the area after Bengali and Somalian. This immediate local context of the Centre is as far removed from the global art elite as possible in a city like London. However, this is a street on the fringes of the rapid and total gentrification project of ‘Kings Cross’. A vast regenerating machine just north of the Euston road that comes complete with its own brand new post code, the European HQ of Google, Central Saint Martins University, the Guardian newspaper and a range of other organisations, institutions and institutes that, together with the European transport links of St. Pancreas International, feed the ambition to re-brand the area as London’s ‘Knowledge Quarter’. In this context, the existing communities of the area, of which many are on low incomes and have limited English language skills, are actively marginalised. This is not a development of the area with and for the local community, but a renovation of their neighbourhood despite them for the benefit of others. It is into this complex territory that Arts Catalyst opened. Given this context, we understood that the first project at the Centre would be key, not only in terms of putting a stake in the ground about the kinds of practices we wanted to support and develop as an organisation, but also in trying to find points of understanding, a shared language, and channels of communication with the local residents. Arctic Perspective Initiative (2006 – ongoing). Marko Peljhan and Matthew Biederman working with Inuit communities of the North and Arctic Regions. As an organisation that commissions artists to critically interrogate the intersections between art, science, technology and their relationship to society, Arts Catalyst has a long history of developing socially and politically critical work. One of the working models Arts Catalyst has consistently employed is a form of situated social practice, developing long-term projects in specific localities that work directly with local constituents. This has included projects such as the Arctic Perspective Initiative; a non-profit consortium led by artists Marko Peljhan and Matthew Biederman that sought to work with, learn from, and empower Inuit communities in the North and Arctic regions through open source technologies and applied education. This included developing hydroponic systems to grow vegetables (otherwise impossible in the Arctic climate), the development of a network of climate sensors, and the design and construction of lightweight, low impact yet highly insulated mobile living modules. Closer to home, East of Eden was a project developed with artist Lucy Stockton-Smith in which she worked with students and staff at Sandwich Technology School in Kent. 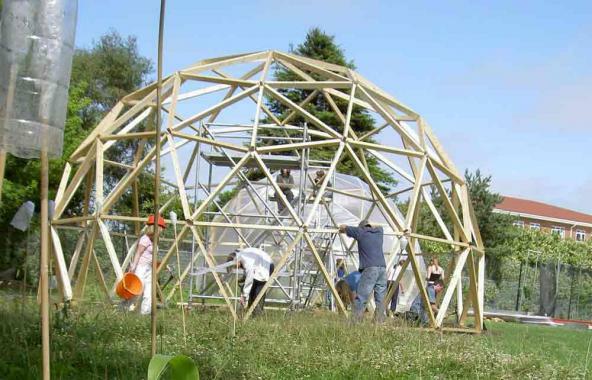 Over 18 months, the group collectively planned, designed, built and fully utilised two geodesic ecology domes on the grounds of the school. One used traditional permaculture methods of farming, the other employed the latest in agricultural technologies and intensities. The contrasting domes served as a starting point for a diverse range of classes and practical workshops led by Stockton-Smith as well as a range of invited practitioners, intervening across the school’s curriculum in science, art, design and technology, geography, music and history. East of Eden (2004 – 2006). Lucy Stockton-Smith & Arts Catalyst with staff and students at Sandwich Technology School in Kent. Understanding this form of practice as a key driver for the organisation moving forward, as well as providing a strategy to meaningfully engage with our local community, we began to develop the first programme for the new Centre. Notes from the Field: Commoning Practices in Art & Science was a multi-faceted project that attempted to re-articulate the role of aesthetics in relation to functionality, exploring the possibility for art to be utilised as a tool or device for social change with and for specific constituencies. Given the organisational context, there was a focus on projects that utilised science and technology to address socio-ecological issues. Notes from the Field began with a two-part exhibition at the Centre; the first part of which was a presentation of films, interviews and objects relating to Arts Catalyst’s long-term social research project Wrecked on the Intertidal Zone. 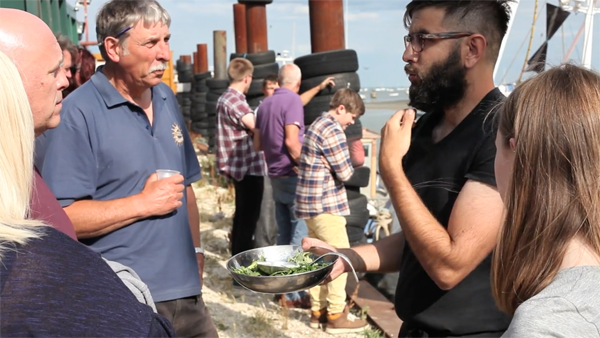 Wrecked was developed with the artist collective YoHa and invited Critical Art Ensemble, Andy Freeman and Fran Gallardo to initiate projects with communities on the Thames estuary over the course of three years. Installation shot of the Wrecked on the Intertidal Zone presentation in Notes from the Field: Commoning Practices in Art & Science. It examined the complex social, industrial and environmental context of the inter-tidal zone of the Thames. 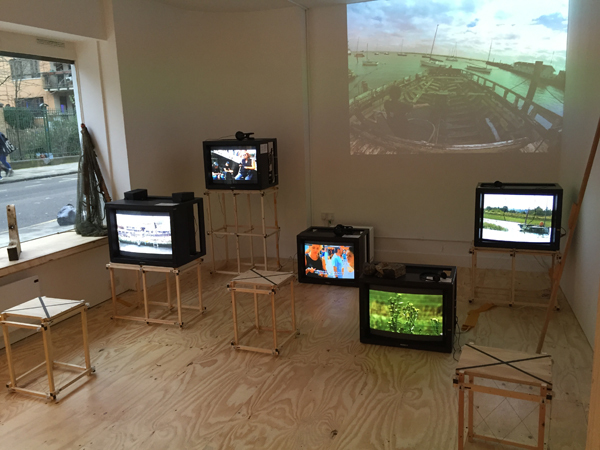 It explored issues as varied as the effects of an international container-port on the ecology of the estuary and traditional industries (such as fishing and cockling), to the lasting contaminations of an old rubbish tip on the nature reserve that has since been overlaid onto the same site. 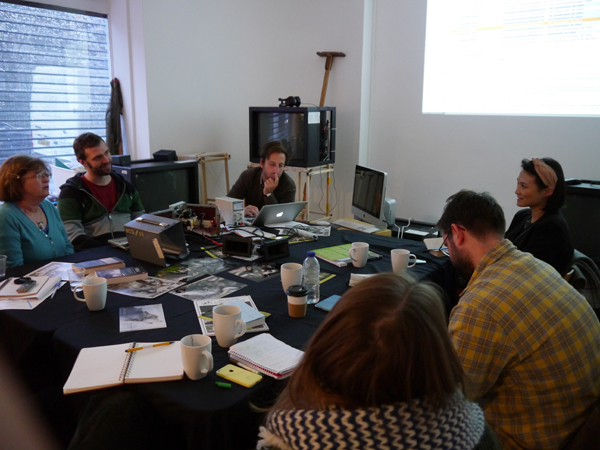 Investigations and interventions included DIY citizen science workshops; eco-political foraging walks and dinners; guided tours with invited experts; as well as interviews, meetings and conversations with local residents. The process culminated in a foraging cook book of eco-political recipes and an anti-monument that recorded the lost species of the area, both social and ecological, engraving them onto the wreck of an old boat taken off the estuary. This Graveyard of Lost Species has since found a home back on the mud, standing as a socially and collectively constructed epitaph to the stark effects of globalising processes on complex social-ecological systems. Albeit a temporary one, lasting only until it is eroded by the changing waters of the estuary. The approach that unified this diverse set of activities was an attempt to convene different forms of knowledge including artistic, scientific and environmental, alongside the situated knowledge of the local constituents. Importantly, working across these different forms of knowledge was driven by an understanding that all were of an equal value, an equal weight, just of different shapes. Tasting event as part of Talking Dirty: Tongue First Research, Fran Gallardo’s contribution to Wrecked on the Intertidal Zone. We wanted to contextualise and analyse these forms of artistic and institutional praxis that Arts Catalyst had been employing and supporting in relation to the growing international discourse on socially driven practice operating on a 1:1 scale. Earlier attempts to convene the varied and multiform set of operations that could be understood as social artistic practices, such as Creative Times LIVING AS FORM, had since been expanded and driven forward with an increased urgency. One of the most comprehensive attempts for us was (and still is) the artwork-as-para-institution Asociacion de Arte Útil. As you probably know by now, given the context of this text on arte-util.org, Arte Útil is a concept developed by the artist Tania Bruguera, borrowing from Pablo España who first used the phrase during a workshop with Tania in Havana in 2003. The English translation of ‘Arte Útil’ would be ‘Useful Art’ but the name is purposefully kept in the artist’s native Spanish (Cuban) due to the additional complexity of meaning, which goes beyond ‘usefulness’ suggesting “art as a tool or device” (Arte Útil) (2). The summation you will find in the about section of this website explains that “Arte Útil draws on artistic thinking to imagine, create and implement tactics that change how we act in society” (Arte Útil) (3). At the core of the Arte Útil project is the Arte Útil archive, a gathering of hundreds of project case studies that those involved understood as Arte Útil from across the globe, and spanning from 1827 until the present. Installation shot of the Arte Util Archive presentation in Notes from the Field: Commoning Practices in Art & Science. The second part of Notes form the Field began with a presentation of the Arte Útil archive, focusing on two specific categories that we felt had most affinity to the ongoing practice of the organisation, namely the categories of ‘Scientific’ and ‘Environment’. This was complicated by the inclusion of a selection of individual projects categorized in different sections across the archive, which we felt fitted within the framework of our investigations. We worked closely with Peter Zuiderwijk of CollectiveWorks.nl in relation to both the spatialisation of the archive and the presentation of ‘Wrecked’. 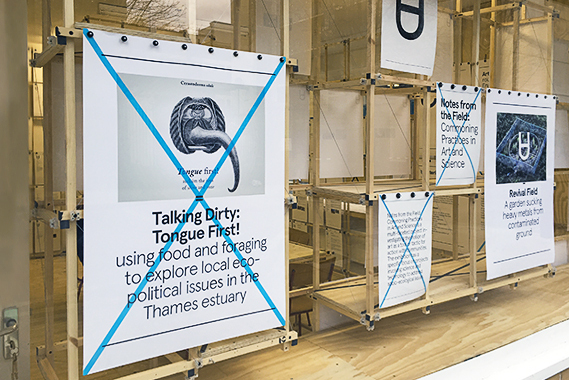 The ambition was not only to achieve a unity of experience between both parts of the exhibition through scenography, but just as importantly to create an active and flexible space that could play host to a range of talks, workshops, events and community meetings throughout the 8 weeks of the exhibition. In addition, we wanted the display system developed to have a life beyond this first programme, to be a structure that could function in different arrangements for different purposes over the course of the next year at the Centre. The result was an adaptable structure designed by Daya Bakker and CollectiveWorks.nl with ConstructLab. Working outwards from the dimensions of the A3 cards of the Arte Útil Archive, the structure used various configurations of this central dimension to create an all-encompassing display system, working both inside and outside the centre to provide poster and signage displays, chairs, tables, lecterns and plinths for users of the exhibition. Exterior view of Notes from the Field: Commoning Practices in Art & Science. This focus on functionality was key, as from that start we understood the contradiction inherent in exhibiting this form of situated social practice in the galleries of an art centre, even one that positioned itself more as an active research and community space. To be captured, categorized and displayed inside the sterile white cube(’ish) is, in many cases, to put these works back into the very context they are fleeing. I can imagine one of the archives protagonists as Michael Corleone, grimacing; “Just when I thought I was out… they pull me back in” (The Godfather Part III, 1990) (4). The historical inevitability of the white cube is something much situated social artistic practice actively fights against. This dominant form of display of our time is not a “transhistorical, transgeographical, or apolitical construct” (Suvakovic, quoted in Filipovic, 2005, p. 68) (5). In fact, its aesthetic ideal is a political construction formed around the myth of art’s representational autonomy. Situated models of praxis like API and East of Eden provide alternatives to this globally hegemonic container, actively seeking new models for cultural practice to relate to its constituency based on the specificities of its own content and context. As such, to bring them back into the gallery, neatly contained on a single side of A3 card, is to remove everything that makes them vital and urgent, neutering their critical potential. With this in mind, our approach to the archive was as a tool, rather than something to be exhibited in and of itself. We used the archive as a catalyst for initiating a broad range of activities, some of which would extend well beyond the duration of the presentation of the archive at the Centre. Our first method of activation of the archive was to actively propose new projects from our specialist area of art, science and technology. Each week, we hosted an invited researcher in residence who would work in the archive room of the exhibition, researching and submitting new projects to be included in the archive. Researchers included Lisa Ma (Design activist), Ben Vickers (Initiator of unMonastery / Curator of Digital, Serpentine Galleries), Neal White (Artist / Office of Experiments), Andy Freeman (Artist) as well as members of the Arts Catalyst team. 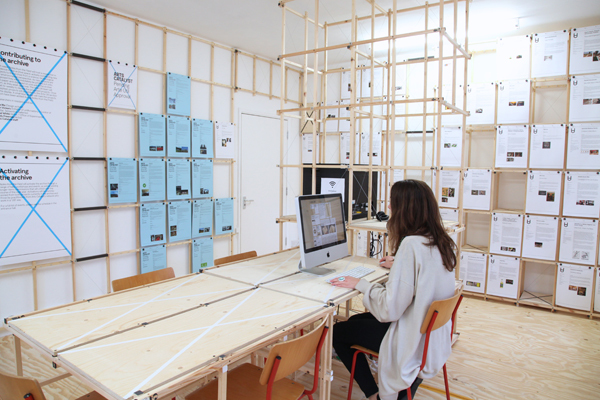 In an attempt to render the submission process visible in the space, proposed projects were immediately printed out on blue paper and displayed on a specific wall in the archive room whilst they awaited approval (or rejection) from the Arte Util committee. If accepted, projects were re-printed on white paper and added to the main Arte Util section of the display, marked with a small blue sticker to identify them as projects that were added during Notes from the Field. If rejected, projects remained on the blue paper and were moved to a partially obscured section of the display system, to highlight their uncertain status in relation to Arte Útil. Fernando García-Dory’s workshop; Inter-species technologies for peripheral contexts (the Bionic Sheep project). Secondly, we developed a range of talks, workshops and events with initiators of projects already in the archive as well as practitioners from Arts Catalyst’s network who we identified as having affinities to the framework of Arte Útil. This included an Assembly of Useful Art that brought together speakers from a range of positions across art, science and technology including artist / designer Veronica Ranner, whose research explores the possibilities of Silk as a biotechnology of the future, the Centre for Alternative Technology who have been exploring alternative environmentally viable ways of living since 1973, Dimitri Launder, ‘the artist gardener’, Graham Harwood (YoHa) initiators of Wrecked! on the Intertidal Zone (see above), complexity scientist Dr Sylvia Nagl, Dr Jonathan Rosenhead, ex-chair of the activist and advocacy group British Society for Social Responsibility, and Gemma Medina Estupiñan from the Arte Útil team, who initiated the project Broadcasting the Archive. This was followed by more than 10 events over the proceeding 8 weeks of the programme, including talks and workshops with project initiators that explored the practicalities for visitors to implement new versions of the projects explored within their own communities. 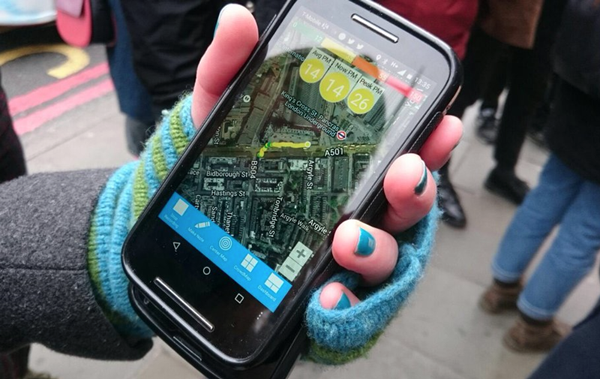 Walking and Sensing in the City, a citizen science workshop led by Andy Freeman. Importantly, Notes from the Field began the process of initiating two new longer-term commissions. The first invited Dimitri Launder (The Artist Gardener) to develop a commission that would build on his medicinal planting systems included within the Arte Útil Archive. The resulting project will be A Remedy for the City, which will see Launder work with communities at The Calthorpe Project, a community garden local to the Arts Catalysts Centre. At the time of writing, this project is ongoing and will unfold over the coming months, with the aim of delivering new practical tools for the community gardens of users. Secondly, October 2016 will see a new commission by Robert Whitman on the occasion of the 50th Anniversary of 9 Evenings: Theatre and Engineering, the first project of Experiments in Art & Technology (E.A.T.) who are included in the Arte Útil Archive. Alongside this new evening of performance will be an exhibition, screenings and talks programme reflecting on the history of E.A.T., transdisciplinary collaboration, and its potential to develop new useful technologies. Imbedded within the commissioning process of this project is an experimental pedagogical programme, working with students from MFA Curating, Goldsmiths University of London, MRes Art: Exhibitions Studies, MA Art & Science and MA Performance Design & Practice all at Central Saint Martins, University of the Arts, London. Nonetheless, the form of situated social practice that is the focus of the Arte Útil Archive and ‘Notes form the Field’ are part of a broader shift in understanding, away from the notion of art as an autonomous representational field. A shift that sees artists and cultural workers disregarding the limited Greenbergian notion of autonomy and its embodiment in the ideologically constructed space of the white cube to re-claim their relationship to the real, re-articulating the role of aesthetics in relation to functionality and moving its scale of operation up to 1:1. Art has become a varied and multiform experimental activity that works trans-disciplinarily, overlapping “transversally with the world through its flight into other disciplines, dispositifs, and regimes, with the purpose of addressing sociopolitical concerns” (Emmelhainz, 2016a) (6). In turn, it has moved from the modernist fight to maintain the myth of representational autonomy, to instead build autonomous spaces in which the rules of the neo-liberal capital machine can be redirected to construct new social relationships and new forms of social reproduction. As such, if we were true to the logic of the forms of practice at the centre of this project, then there wouldn’t be an exhibition at all, nor would there be an archive of Arte Útil. Instead we would be putting all our efforts into initiating and supporting the development of new Util projects out in the world. Something an organisation like Arts Catalyst has been doing and will continue to do. So why then is their representation in a gallery still one of the dominant forms of relation between these practices and arts institutions? And why did we at Arts Catalyst do just that, knowing the contradiction between the logic of the work and such a presentation? I would argue it is because this way of working allows the host organisation to recognise and register critical social practice, whilst still fulfilling the production imperative of the contemporary art institution, necessitated by having a public facing building needing to be filled. It also works within the rigid time management regime of the contemporary institution, reproduced by a complex range of interlocutors from local politicians, to funders, to a visiting public, all prioritizing (demanding even) a continual stream of temporary fixed term exhibitions, over long-term processual projects, for which outcomes are unclear. Moreover, if we look at the positives of this model, one could argue that such presentations give a valuable overview (albeit a partial and subjective one) of dispersed models of working, allowing visitors insight into a range of practices they would otherwise not have access to. It can also serve to provide a historical context for a specific form of practice and a public platform for the projects included, giving them (at times much needed) visibility. Finally, when such projects bring initiators together, they have the potential to convene new meetings allowing for the sharing of urgencies, experiences and difficulties faced on the ground, perhaps even sparking new trans-local collaborations. 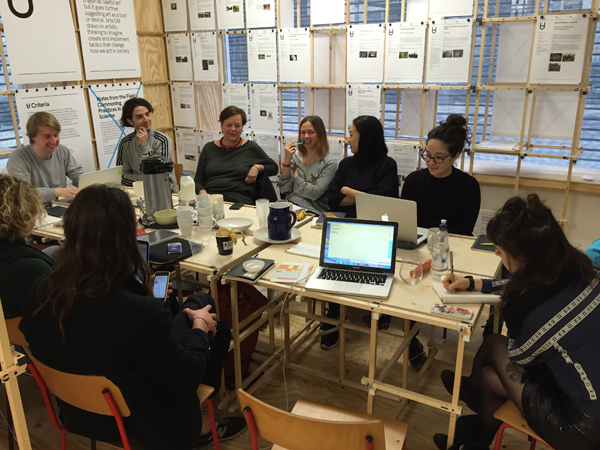 Students from Goldsmiths Centre for Research Architecture use the archive room to discuss the next project at Arts Catalyst, building on Arte Util; Everyday Urbanism: Architecture as Social Process. Accepting there is a value in forms of representation such as the Arte Útil Archive or Notes form the Field, despite the inherent contradictions imbedded in any such initiative, we must look more critically at some of the specificities of how Arte Útil in particular is structured. The model of meta-artwork or artwork-as-para-institution employed raises two key issues. Firstly, there is a clash between the collective imperative of many Arte Útil projects and the dominant logic of individual authorship necessary for such an initiative to have currency within the broader institutions of art. The result is what we might call a ‘double economy of visibility’. Despite attempts by those leading the Arte Útil initiative to make explicit the collective nature of the project’s development and even to attempt to position it as a movement, Arte Útil still primarily circulates as a project initiated by Tania Bruguera. As such, the development and continued distribution of Arte Útil primarily serves to benefit Bruguera’s career and position as uber-political artist, as well as the positions of the institutions, curators and directors who present and activate the archive (I include myself and Arts Catalyst in this). Those involved in the nitty-gritty of situated daily struggle, the initiators of individual projects contained within the archive and their users, can be relatively obscured by the critical mass of hundreds of archive projects if not properly mediated. Secondly, there is the issue of the process by which projects are selected to be included in the archive; who decides what is and what’s not Arte Útil, and how. In the case of the Arte Útil, the selection committee is made up of Brugerra herself alongside the directors and curators of the maintaining institutions. In an attempt to make their selection process as transparent as possible, the Arte Útil team collectively produced 8 criteria when the archive was first established (see the about page of this website), both in order to develop a collective understanding of what constituted Arte Útil and to be able to share that understanding with the public. However, those on the selection committee can of course only ever apply these criteria subjectively. The result being that certain projects are held more or less to account than others, on one or more of the painstakingly composed points, ultimately undermining the attempted objectivity that such a list represents. In terms of the administrative heart of the selection process, Notes form the Field challenged the existing model somewhat, particularly its pace. The act of materialising the selection process by displaying cards differently at the various stages of (non)approval necessitated a quick turnaround on decisions across a relatively large number of new submissions every few weeks. The Arte Útil team were extremely gracious in accommodating and supporting our endeavour, particularly Gemma Medina and Alessandra Saviotti who initiated a new online procedure for projects to be reviewed, without the board having to meet in person as had been the case to date. However, one issue this methodology raised was a lack of immediately available feedback as to why individual projects were or were not accepted. Previously, projects inclusion had been collectively discussed amongst the committee in person, meaning any decision-making process was verbalised and as such could be shared with those submitting. This new, quicker system meant projects were accepted or rejected without comment. This left us in a challenging situation with our researchers in residence who had given their time, effort and knowledge to propose new projects for the archive. All we could share regarding the outcome of their labour was a simple in or out, without any further reasoning. Following a conversation, Gemma and Alessandra did go back over the submissions and worked hard to ensure we had feedback on each, but this was some time after the end of the project. Moreover, I would argue it is key these conversations around inclusion or exclusion in relation to the Arte Útil Archive are not only shared with those who submitted a given project, but should be rendered visible through open and public debate. This leads us to what I see as the larger conceptual / ethical issue about the process of inclusion and exclusion within the Ate Útil ‘movement’. The current methodology is constructed on exactly the same logic as has always been employed within a conventional institutional landscape. A system of hierarchy in which a network of elite international museum directors and artist(s) (albeit politically motivated and activist ones) make the decisions of what Arte Útil is and what it’s not. This may seem only logical; as the founders and experts in the field they must be best placed to make the call, right? And surely an entirely inclusive archive would quickly lose any cohesive position and therefore its radical potential? Here we must be careful, as this is a position that has been used to keep power in the hands of those that have it since institutions began. For an initiative with radical political intent such as Arte Útil, it is essential that the form of any selection process live up to the collective ethical imperative of the projects it represents. If Arte Útil wants to fulfil its ambition to represent (or even be) a movement, it must open up decisions about what that movement is to all those it frames within it. I would argue all the initiators and all the users of the projects included within the archive should be included in the process setting the boundaries of inclusion and exclusion for their community. Exactly how this might be achieved is of course a complex problem with no easy solutions. But the opportunity of a para-institution with a focus on such radical forms of practice must be seized to develop new radical institutional processes. Otherwise, the Arte Útil archive is in danger of repeating the same logics of power its contents are actively fighting against. To further interrogate this fundamental issue, we can draw a useful comparison between the Arte Útil meta body and one of the main problems faced by many of the Arte Útil projects, namely the interrelated issues of duration, maintenance and sustainability. In order for a project to pursue sustainability and create a model that is viable over the longer term (number 7 of the Arte Útil criteria) it has to put in place reflexive systems that allow it to grow and adapt to our dynamic reality. Importantly, such a system must allow the project to operate and grow beyond / without its initiator(s), encouraging the possibility that its community of users and maintainers might carry it forward independently. Of course, there is no easy way to transition an Arte Útil project away from its initiator whilst ensuring that the key political agendas and ethical urgencies remain. Once the initiator is no longer involved, there will be inevitable conflicts, redirections, misunderstandings and misuses in relation to the project’s founding imperatives. However, some of the projects within the archive such as Bumi Pemuda Rahayu (Nr. 542) (7) are already in the process of taking this delicate step. In so doing they are revealing that these conflicts, redirections, misunderstandings and misuses might create potentially productive failures. Moreover, even if handover leads a project to inhabit entirely different urgencies, forms and focuses than its initiator(s) intended, such a step is essential to fully realise the collective imperatives of many such projects. Here, perhaps the Arte Útil body can learn from its contents. A lesson, I would argue, it must take on board if it is to have any relevance over a longer term. Whilst there is undoubtedly an ever-increasing number of practitioners working to re-articulate the role of aesthetics in relation to functionality, accompanied by an ever-growing urgency for such forms of practice, the usefulness of the Arte Útil para-institution and what such an overarching body can deliver has to be continually renegotiated. 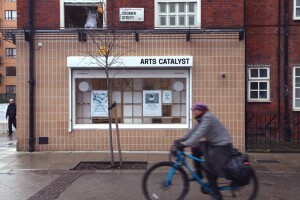 (1) Arts Catalyst did previously occupy an office in Farringdon for a year that was also used as a public events space. (2) Arte Útil (no date) Available at: http://www.arte-util.org (Accessed: 20 August 2016). (3) Arte Útil (no date) Available at: http://www.arte-util.org (Accessed: 20 August 2016). (4) Corleone, M. in The Godfather Part III (1990) Directed by Francis Ford Coppola [Film]. US: Paramount Pictures. (5) Filipovic, E. (2005) ‘The Global White Cube’, The Manifesta Decade: Debates on Contemporary Art Exhibitions and Biennials in Post-Wall Europe, pp. 63–84. (6) Emmelhainz, I. (2016a) Geopolitics and contemporary art, part I: From representation’s ruin to salvaging the real. Available at: http://www.e-flux.com/journal/geopolitics-and-contemporary-art-part-1-from-representations-ruin-to-salvaging-the-real/ (Accessed: 20 August 2016). (7) Arte Útil (no date) Available at: http://www.arte-util.org (Accessed: 20 August 2016). Alec Steadman is a curator and researcher based in London, Europe. He has been Curator at Arts Catalyst since March 2015. From November 2016 he will move to Indonesia to become co-Chief Curator at Cemeti Art House, Yogyakarta, where he will work collectively to transform Art House into Institute for Art and Society.